David Fritzler pours up a Blue Blazer cocktail at Tryst. Photo credit: Samer Farha. 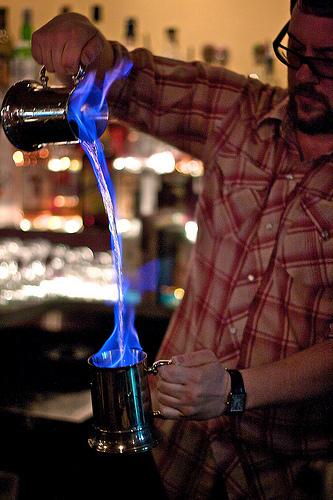 I first met David Fritzler back in January when fellow WLDC author Samer and I watched him pour up an impressive flaming Blue Blazer at Tryst. You might think such pyrotechnics indicate a showy brash personality, but that’s far from the case. As I saw this summer when he served up his Rickey Contest entry, he’s a thoughtful crafter of cocktails. It was that Smokin’ Joe Rickey, somehow reminiscent of Lapsang Souchang tea, that made me want to learn more. David was kind to sit down with me at Tryst this past weekend and let me sample a few of their new warming cocktails while discussing his drinks philosophy. Tryst has been an Adams Morgan neighborhood favorite since it opened in 1998, and it’s still going strong, recently winning Best Local Coffeehouse of 2010 in Express Night Out. 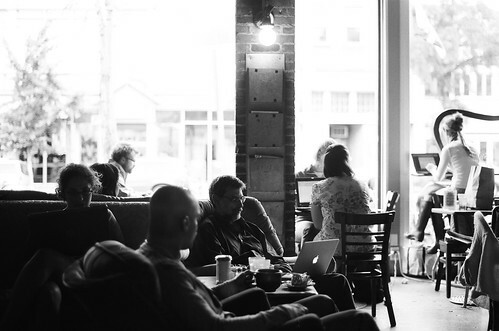 For many of my friends it’s their “third place” – office, studyhall, living room – and it inspires a great deal of local love. David’s been there almost since the beginning, ten years of dedication. As beverage director, it’s not all flash – at the end of our chat he was off to Open City to take apart the espresso machine. As a native of coffee-loving Portland, David got his start as a bartender working at “a funny little institution” called the Driftwood Room in the historic Mallory Hotel, a turn-of-the-century gem (now the Hotel Deluxe). He’s spent the last ten years here as a Mount Pleasant resident, and loves the supportive nature of DC’s bar culture. “Everyone’s low key, no ego,” he explains, “everyone helps each other.” As a veteran of barista and cocktail competitions, a member of the Barista Guild and the DC Craft Bartenders Guild, he definitely speaks from experience. David’s also very involved as a coffee cupping leader – Tryst gets its coffee from Counter Culture, which hosts cuppings at their nearby training facility on Friday mornings. Tryst serves up coffee in the Northern Italian tradition, and it’s part of David’s job as beverage director to translate that to patrons. He has a strong desire to change the way Americans drink, like helping them learn to enjoy coffee in smaller portions. That goes for cocktails too. While I was perched at the bar I sipped my drink out of a little coupe glass, the perfect size for his potent William Tell Routine cocktail composed of calvados, arrack, honey, lime and spiced bitters. A larger portion would’ve been overkill. This was just right, all the flavors in perfect balance, with the coupe shape allowing the beautiful honey scent to permeate. 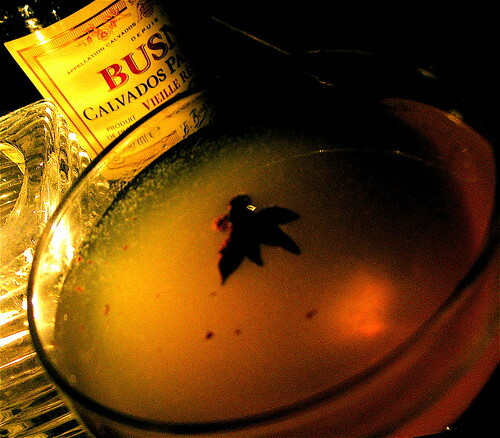 The combination of calvados and a star anise floating on top was absolutely autumn in a glass. Calvados is a French apple brandy making a resurgence around town right now, and it’s a great way to turn people on to better tasting drinks than an overly sweet appletini. “I just had a patron send back a drink because it wasn’t green enough,” David says, but he’s smiling and again he’s too gracious about the beverage director’s role as educator to be condescending. That philosophy really comes through at Tryst. As I sat at the little bar watching David’s co-worker warm up a Tryst Toddy (bourbon, Punt e Mes, honey, Darjeeling tea – um yes, I will be back for several of those this winter) it struck me how relaxing the scene was despite it being full-up on a Sunday night. 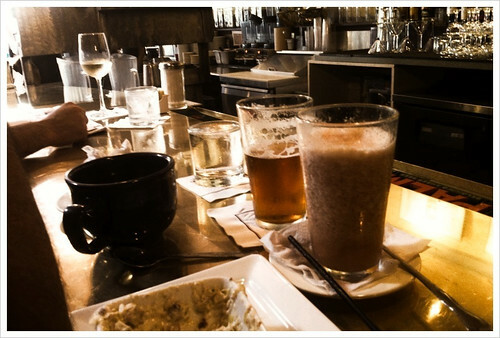 David’s description of his favorite drinks – “smart, accessible, understated” – easily could be applied to Tryst itself. My favorite drink that evening was something David improvised when I mentioned how much I loved rye whiskey. It was a twist on a cocktail called the Bensonhurst, which has Old Overholt, Dolin Blanc, Averna Amaro and house-made sassafras bitters. To make it a warm drink, David added a black tea with vanilla and orchid from Serendipitea. The tea has an amazingly rich flavor (so he left out the bitters usually used in the cold cocktail) that combined with the liquors in such a way I was sure I was tasting coconut. It was positively transporting. While I was raving about the heavenly elusive (and probably non-existent) coconut, a close friend who considers Tryst his “office” wandered in. As David went off to rescue the wounded espresso machine, my friend and I strolled down memory lane fueled by coffee and cocktails. The room was gently buzzing with others doing the same, gearing up for the long week ahead. As I recall it now, the scent of that warm, happy drink is completely fused to the memory of my friend and I laughing. 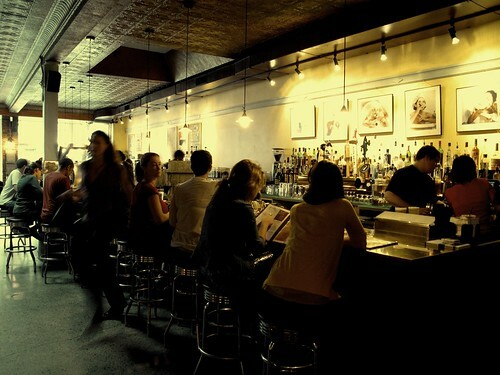 Many thanks to David Fritzler and the folks at Tryst for letting me sample drinks and get in the way of a busy bar. Love me some David Fritzler. Fritzler brings skill to the game.